On a hot end-May bank holiday Monday, Chris, Keith and Phil flew the flag for the Project at the Shipley Village Fete…until the thunder drove them home! 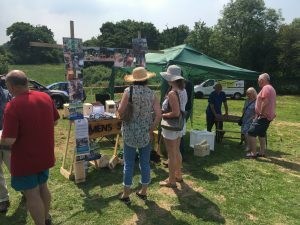 The annual fete is well supported by the local community and villages around Shipley and it was a great opportunity to tell people about the various activities. There really was a lot of interest and lots of people stopped to chat. There were a few of the smaller items made by the Shedders on display; the bird boxes got a lot of interest and stocks are now well depleted. Sincere thanks to Chris and Keith for giving up so much of their time for the Men’s Shed in particular, and being such enthusiastic front-men for the project! Posted in Hills Farm Lane Vets Football, Men's Shed, Petanque, The Green Project, Uncategorised, Walking Football.